The driveway leading up to your home is often one of the last things that comes to mind when you’re thinking about improving the curb appeal of your property, but this low-cost property maintenance task makes a dramatic visual difference for any property and it shouldn’t be overlooked. This is a good question and the answer is… It really varies. Mostly it depends on where your property is located and the immediate surrounding environment. If your property has lots of mature trees or shrubs that overhang or run alongside your driveway there will be a lot of tree pollens, sap and other organic debris collecting on your driveway. This organic debris that collects on the driveway then contributes to algae, moss and other organic growth. If your driveway is shaded with lots of tree or hedge cover it will grow algae and moss much faster and you should consider power washing it at least every 2 years, it wouldn’t hurt to power wash the driveway and then have it sealed to which can help prevent the growth in the first place. For properties with driveways that bask in the sun all day and have very little shade and organic debris that collects on top they create a very undesirable environment for algae, moss and other organic growth but they can still collect dust, dirt, mud, oil and other contaminants. 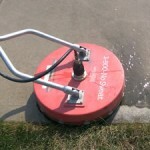 Every 1-2 years is generally a good cycle for power washing an average driveway in the Indianapolis area. Can You Power Wash The Driveway On Your Own? As professionals we use a piece of equipment called a “surface cleaner” and it evenly disperses the water over a much larger area (usually 12″-16″) and at a fixed set height over the concrete. Utilizing a surface cleaner with the power washer helps protect our customers concrete from any damage and actually does a more thorough job of cleaning concrete surfaces anyway.Yes, of course you can! You just want to make sure you’ve got the right equipment and a few hours of spare time. While a regular pressure washer can work, it will also unnecessarily cause wear and tear on your concrete driveway, accelerating the erosion process. 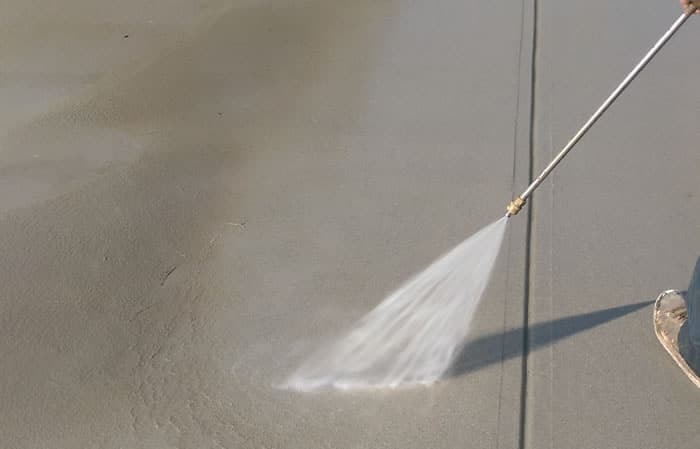 Remember, concrete is porous and meant to actually absorb water and let it pass through, if you blast it with high pressure you’re going to effectively be removing some of the surface which will roughen up the concrete considerably, it will be clean, but the surface will have been damaged! The surface cleaner also works to protect your gardens, garage doors, exterior walls and other landscape features from any overspray that a normal power washer would cause. What Type Of Stains Can Be Removed From a Driveway? Driveways can collect all kinds of stains from tree saps and oils to automotive oils to chewing gum, dirt, mud, bird poop and more. 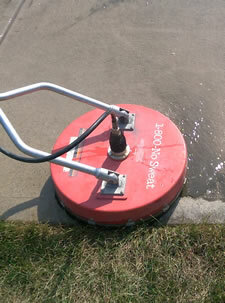 All of these can be removed using a pressure washer and the right detergents or degreasers on the driveway. In most cases degreasers and detergents aren’t necessary but are available for really stubborn stains and there are many environmentally friendly options too. How Much Will It Cost To Clean Your Driveway? That’s a tough question to answer over the Internet. Power washing a driveway is usually estimated and charged by the square foot, this cost can vary from as low as .20 cents per sq ft. up to .25 cents per square foot depending on how soiled and dirty the surface is, what type of material it is (interlocking brick or concrete) the overall size of the driveway and working conditions. Do we need to move any furniture or clutter before we can start? Will there be vehicles such as RV’s or Boats we need to work around? Do you have pets we need to be concerned about? Do you want us to seal the driveway with a proper sealer? Ensuring that we have easy and unblocked access to the entire driveway the minute we arrive to your home definitely makes the job easier for us because it saves us time. We are happy to move items off your driveway or protect gardens and your property but we need to know ahead of time so we can account for this time in your estimate. If your driveway is heavily soiled and hasn’t been cleaned in a few years then you’ve possibly forgotten about the hidden gem you’ve got buried under all that algae, dirt and grime. A quick power wash will return your driveway to it’s original bright, clean and new looking appearance. Add a concrete sealer into the mix and you’ll protect your driveway from future problems such as weather erosion, staining and mold, moss and mildew growth. Driveway cleaning and concrete sealing is an excellent project for homeowners who might be looking to sell their home or also for a neglected property that just needs some TLC. It’s an affordable home improvement project that will make an immediate visual impact without making an enormous investment. Would You Like an Estimate To Power Wash Your Driveway? White’s Painting and Power Washing is a full service exterior power washing contractor that offers driveway cleaning services. We use special attachments called surface cleaners along with the appropriate (and environmentally friendly) detergents or degreasers to wash away years of dirt and grime from your driveway and other exterior concrete surfaces. If you’d like an estimate to clean and power wash and/or seal your concrete driveway located in the Indianapolis area please give us a call or fill out our contact form today and we’ll schedule a date for your estimate. You do not need to be present for the estimate unless you have specific questions or concerns. We just need to take a quick square footage measurement and get a good look at the driveway.